This is Jon. I took two days off last week and the first day we went to the Moses Lake waterpark about an hour away. The girls love the water and it was relatively cheap entertainment for all of us, especially since we could bring in our own cooler full of food and water. We enjoyed the lazy river, activity pool, waterslides (for kids and adults), splash zone and the body boarding and surfing waves. We doubled up on the sunscreen as it was easily in the high 90s, but I could be convinced it was hotter than that. 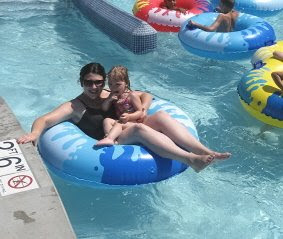 Mommy and Addy on the lazy river. Zach, his friend Alex and Delaney. Delaney didn't want to do anything except sit on her lap. They're total best friends according to D-Rae. This was my attempt at surfing the second time. The first time I hit the water instantly and decided to have the attendant steady me with a rope while I got my balance. Brittany took this picture about 1.5 seconds after I started the ride. You can imagine what the next half second looked like. This is Jon. I've been getting in the habit of jumping into the river after a run or a hike and today I just decided to do it for two reasons: 1. Because it's there. 2. Because I'm a man. Back in the day, I - along with Ryan, Dan and Josh - would go to the park to play football, impress girls and jump in the lake and river, so today was a trip down memory lane. Jon and Adelyn with Blue Grandpa. Addy and Daddy, knee deep in the lake. Great job by Brittany capturing the moment. 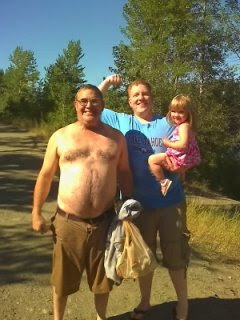 Blue Grandpa and Addy Bear testing out the water at the river's edge. Another great capture of a pure athlete in the zone. This is Jon. I've been getting out way more these past few weeks (been in the pool for a while) and I forgot how much I like hiking. Dad, Jerrod and I were emailing each other the other day (I was trying to work, I don't know what the heck those guys do all day.......) about trying to get the legs back in shape for bigger endeavors. This one helped me get reacquainted with nature for sure. 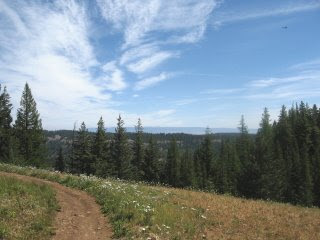 I could be wrong, but I believe we're looking east toward Ellensburg. Not sure. Manastash Creek, right before Lost Lake. Lost Lake. Perfect name for it. I was walking through some thick woods, and all of a sudden this lake appeared. Right in front of me is a clearing perfect for a overnight stay. I'm thinking about coming back very soon. This is Jon. Brittany found the girls wearing her glasses the other day and instead of taking them off for fear they would ruin their eyes, she picked up the camera and recorded the history. 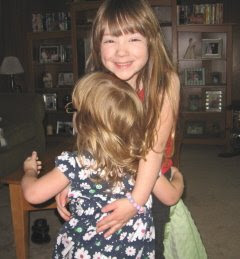 D-Rae and Addy Bear with a big hug. Delaney is queen of the saucy look. As her protective father, this look worries me. Adelyn with her trademark huge smile. This is Jon. Thought I would update you on the garden and throw a couple of photos in of the girls as well. 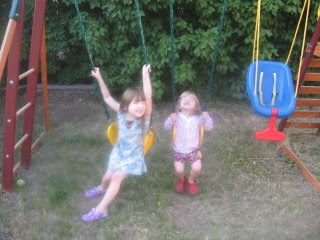 Delaney has always been able to swing in the big girl swing ever since we got the swing set/big toy last year. Adelyn is just now getting comfortable with the big girl swing, but isn't as much of a daredevil on it yet. However, the girl has no sense of fear at times on other playground big toys, which causes plenty of fear with both me and Brittany! This is after picking very little of our Rainier Cherry tree in our back yard. Not sure how many more I'm going to get since the birds are really getting to the cherries that are above 10 feet in the tree. For some reason our apricots aren't ripening as quickly as last year, so I figure we've got another couple of weeks before we can pick those. More pictures from Ocean Shores. 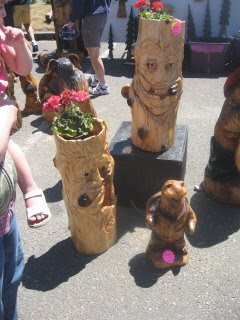 These woodcarvers take a log/stump/tree and make it into some crazy art. The only thing I can cut with a chain saw is my hand off. My three girls, frolicking in the sand. Delaney was very wary of the water. The last time she was at the ocean, I had to pull her out of the water with all my strength because she loved it so much. Not last weekend, she was beyond scared. Adelyn, however, was enthralled with the ocean. The girls spent time looking for sand dollars and crabs and whatever they could find on the beach. It's hard to see, but behind us was a skull and crossbones with a silver tooth (made from aluminum foil) and a red bandana. These people were crazy artistic. Being the true manly American that I am, you can't go to the beach without jumping in the water. Brittany didn't understand it, Adelyn was perplexed and Delaney cried for my safety. But the point is, I manned up. Yep, this is how I roll. This is Jon. 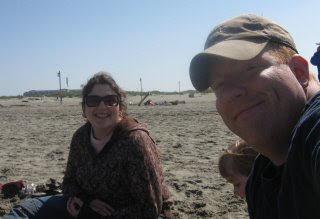 We took the girls to Ocean Shores last weekend and they had a great time. The last weekend in June is the sand castle and wood carving weekend and it was pretty packed, but not so much to where we didn't enjoy the sun and sand. Quick snapshot of my girl. Ocean Shores, it's been in the middle of the fall for our anniversary (1st and 5th anniversaries), so the weather creates some crazy waves at the jetty. There weren't any this day, in fact there was barely a breeze on Saturday. There were dogs on the beach and a group of them were barking for a short period of time before stopping. Not sure if Adelyn's suggestion had anything to do with that. Proud parents of Delaney and Adelyn, happily married. We enjoy living in this area and love our family more than anything!